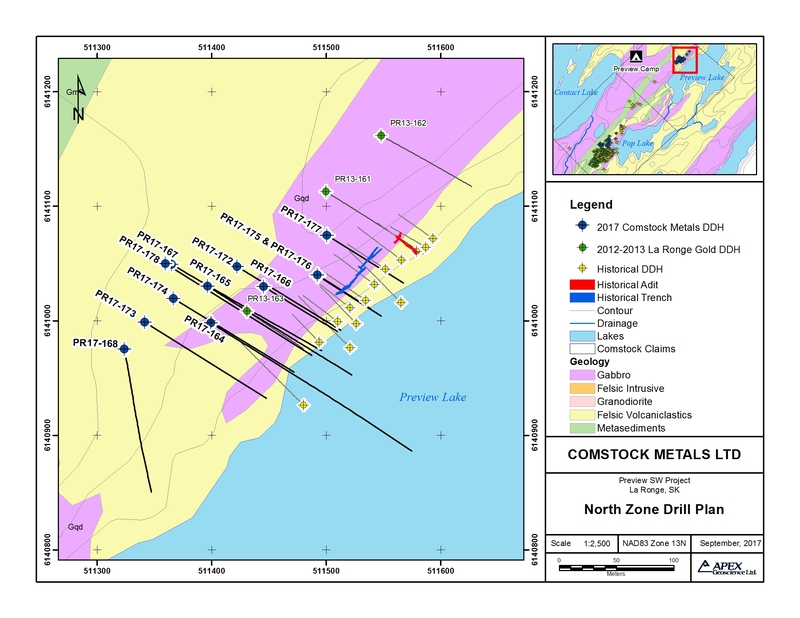 Vancouver, BC – September 28, 2017 – Comstock Metals Ltd. (TSX-V: CSL) (“Comstock” or the “Company“) is pleased to report partial results from the summer diamond drilling program at its 100% owned Preview SW gold project located 40 km northeast of La Ronge, Saskatchewan. These results are from 1094.5 m in 7 NQ drill holes completed on the North zone and they continue to build on the strong results returned from the winter 2017 drilling program. “We are encouraged that we continue to intersect and extend the limits of high-grade gold mineralization at Preview North. Our success at the North zone and Preview SW deposit supports our belief that the 5.7 km long Preview Structural Corridor plays a significant role in controlling gold mineralization on the property. We will continue to focus on our exploration efforts along this trend” commented Comstock CEO David Terry. The 2017 Preview North zone holes were designed to test for lateral and down-dip extensions to multiple high-grade gold intercepts previously reported in the Company’s May 8, 2017 and June 7, 2017 news releases and from PR13-163 (17.98 g/t Au over 5.71 m starting at 10 m below surface, 5.96 g/t Au over 5.66 m starting at 19 m below surface and, 1.88 g/t Au over 21.26 m starting at 29 m below surface1). Each of the 2017 holes encountered multiple zones of gold mineralization associated with quartz-carbonate vein zones and variable sulphide content in sheared intermediate-mafic meta-volcanic rocks; visible gold was observed in drill holes PR17-164 and PR17-165 (May 8, 2017 news release) and holes PR17-175-178, reported herein. A total of 3,888.5 m in 19 NQ diamond holes were drilled during the winter and summer 2017 campaigns of which 2111.5 m in 11 holes was completed during the summer program; 7 on the Preview North zone, reported herein, and 4 at the southern end of the Preview SW deposit. 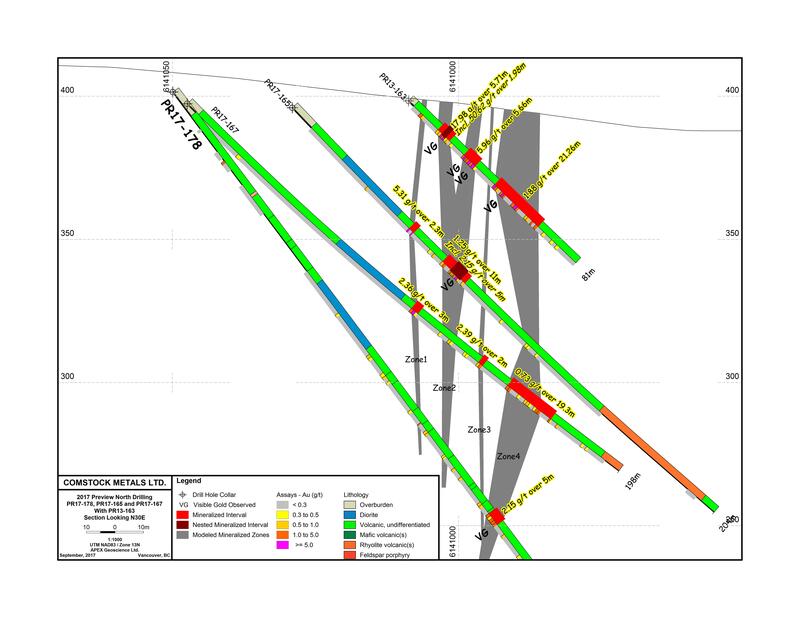 The new drilling, combined with historical work at the North Zone, has outlined a composite zone of up to 5 parallel shear hosted veins/vein zones extending 350 m along strike and to a depth up to 140 m below surface; higher grades intersected to date occur within a core zone over a strike length of approximately 170 m. Structural data collected during the winter and summer programs indicates a steep southwest plunge to the mineralization, suggesting good potential for encountering additional gold mineralization at depth. The Company has integrated the current results from the North zone into its project database along with structural, lithological and other information, and will be incorporating the new information into the 3D model developed for the project over the summer to determine appropriate next steps in exploring the North zone. Significant weighted average intercepts are presented in Table 1. Hole locations are shown on Map 1. Interpretation of historical exploration, recent and current diamond drill results of Comstock, suggest the presence of steeply plunging high grade gold zones at both the North Zone and Preview SW deposit, however further work and interpretation is required to determine the continuity of individual gold intercepts between holes. Drill hole location and orientation details are provided below in Table 2. The Preview North zone is approximately 2.6 kilometres to the northeast of the Preview SW deposit within the Preview Structural Corridor (PSC) that links the two areas and extends approximately 5.7 kilometres along the length of the property. Half of the PSC on the property remains untested by drilling southwest of the Preview SW deposit. Historic (circa 1940’s and 1960’s) diamond drilling, limited surface and underground bulk sampling and gold production via a 50 m trench and 20 m exploration adit, in addition to three widely spaced diamond drill holes completed in 2013, and the 2017 drill programs, have tested gold bearing quartz veins at Preview North over a 350 m northeast trending strike length and down to a maximum of 140 m vertical depth. Narrow quartz-carbonate veins locally containing coarse visible gold are hosted within a 40 m to 70 m true-width zone of strongly foliated pyrite-arsenopyrite (±chalcopyrite) mineralized intermediate to mafic meta-volcanic rocks. Host meta-volcanic rocks occur on the northeast margin of a less deformed coarse grained magnetic diorite intrusive body. Mineralization locally forms broad zones of highly strained, silicified, folded and boudinaged quartz-carbonate veins. Based on limited current and historic drilling, oriented drill core and surface structural measurements, surface trenching, and underground exploration a total of five (5) distinct shear zone hosted quartz-carbonate veins/vein zones are modelled with higher grade zones of mineralization apparently plunging steeply to the southwest. The current drilling program at the Preview North zone followed up on multiple high-grade gold zone intercepts from the 1,777 m winter 2017 drilling program and from drill hole PR13-163 via along strike and down-dip step-outs. 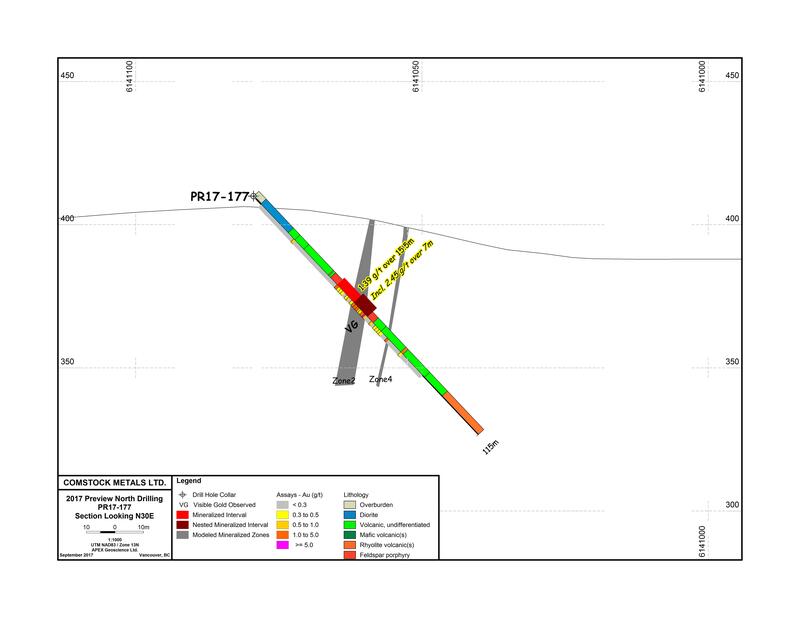 North Zone drill hole PR17-172 (-45o/121.5 azimuth), a 30 m step-back designed to test the down-dip extent of mineralization intersected in PR17-166, passed through diorite hanging wall rocks into mineralized meta-volcanics at a depth of 39.4m downhole (see Section 1). Three broad quartz carbonate high strain zones were intersected at downhole depths of 46.3 m, 81.0 m and 105.0 m. The two upper zones are associated with strained, locally refolded meta-volcanic rocks hosting zones of foliation-parallel carbonate veining and pyrite mineralization over 11.7 m core width and 8.0 m core width, respectively. The lower zone is associated with decreased deformation intensity, increased chlorite alteration and increased pyrite mineralization over an interval of 20.0 m core width. Footwall felsic meta-volcanic rocks were intersected at 133.1 m downhole. 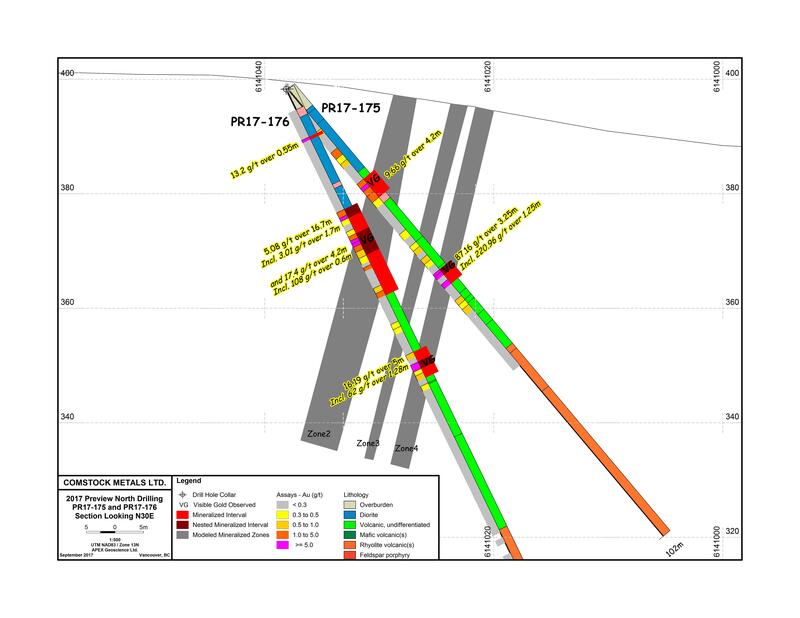 North Zone drill hole PR17-173 (-45o/122 azimuth), drilled between the sections with holes PR17-164; 174 and PR17-168, was designed to test the southwest continuity of the Preview North mineralized zones. The hole collared into meta-volcanic rocks and passed through diorite from 44.0 m and 59.9 m (see Section 2). At 70.0 m and 92.0 m, strained, folded and chlorite altered meta-volcanic rocks host narrow zones of foliation-parallel carbonate veinlets. Below, at 110.0 m and 115.9 m, strained and folded meta-volcanic rocks host narrow zones of quartz carbonate veining with associated pyrrhotite mineralization. Footwall felsic meta-volcanic rocks were intersected at 162.5 m downhole. 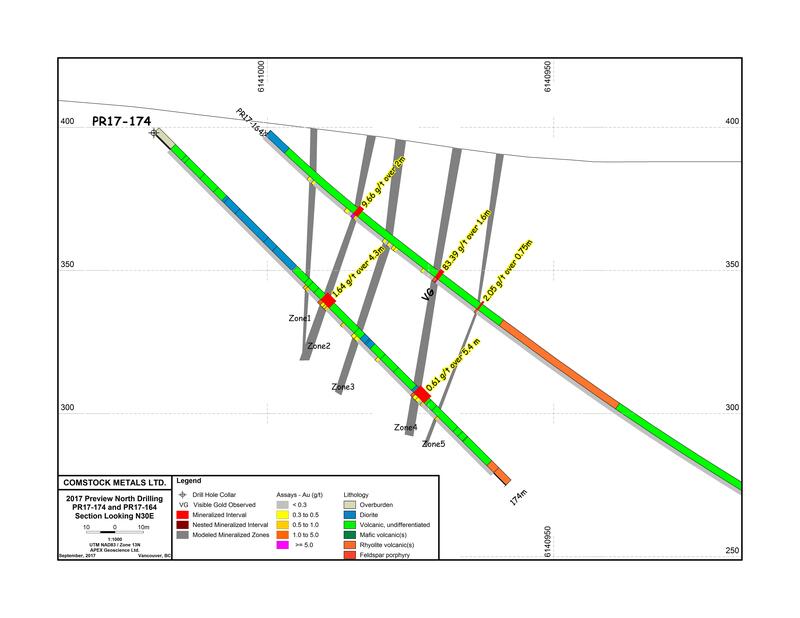 North Zone drill hole PR17-174 (-45o/122 azimuth), a 40 m step-back designed to test the down-dip extent of mineralization intersected in PR17-164, collared into meta-volcanic rocks and passed through diorite hanging wall rocks from 33.5 m to 68.1 m (see Section 3). At a depth of 82.3 m downhole, highly strained and locally refolded meta-volcanic rocks host quartz carbonate veining associated with pyrite-pyrrhotite mineralization over an interval of 4.3 m core width. Footwall felsic meta-volcanic rocks were intersected at 164.4 m downhole. North Zone drill holes PR17-175 (-49.9o/122.5 azimuth) and PR17-176 (-64.2o/122.5 azimuth) were drilled from a single pad 35 m northeast of the section containing PR17-166 and 172 and below the southwestern end of the 50 m long trench. Both holes encountered two zones of quartz-carbonate veining within highly strained meta-volcanic rocks (see Section 4). The vein zones are associated with arsenopyrite-pyrite mineralization, variable chlorite alteration and multiple occurrences of visible gold. The upper zone was intersected at 20.5 m in PR17-175 and at 23.3 m in PR17-176, having core widths of 4.2 m and 16.7 m, respectively. The lower zone was intersected at 41.1 m in PR17-175 and at 51.0 m in PR17-176, having core widths of 3.25 m and 5.0 m, respectively. 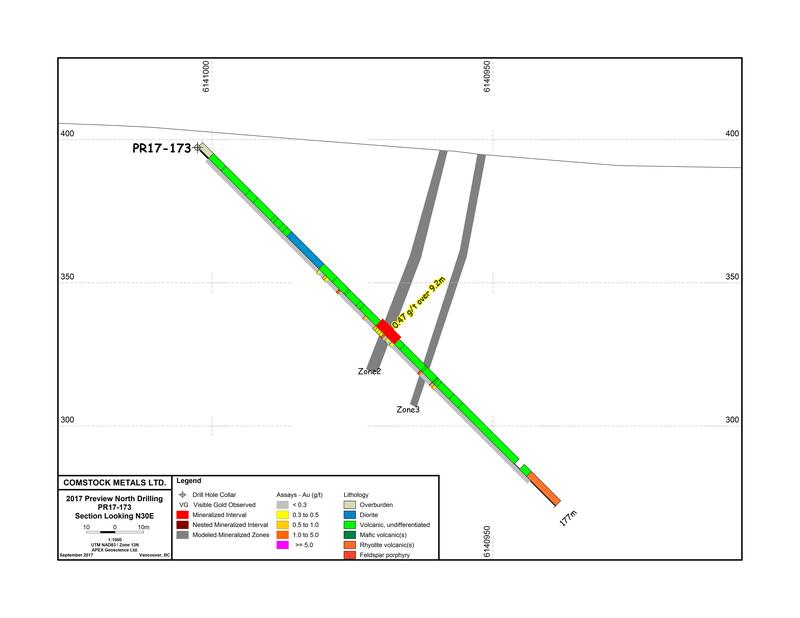 An additional, narrow vein zone was intersected at 9.25 m downhole in PR17-176, and is associated with arsenopyrite-pyrite mineralization and minor chlorite alteration. Footwall felsic meta-volcanic rocks were intersected at 59.2 m downhole in PR17-175 and at 85.5 m downhole in PR17-176. 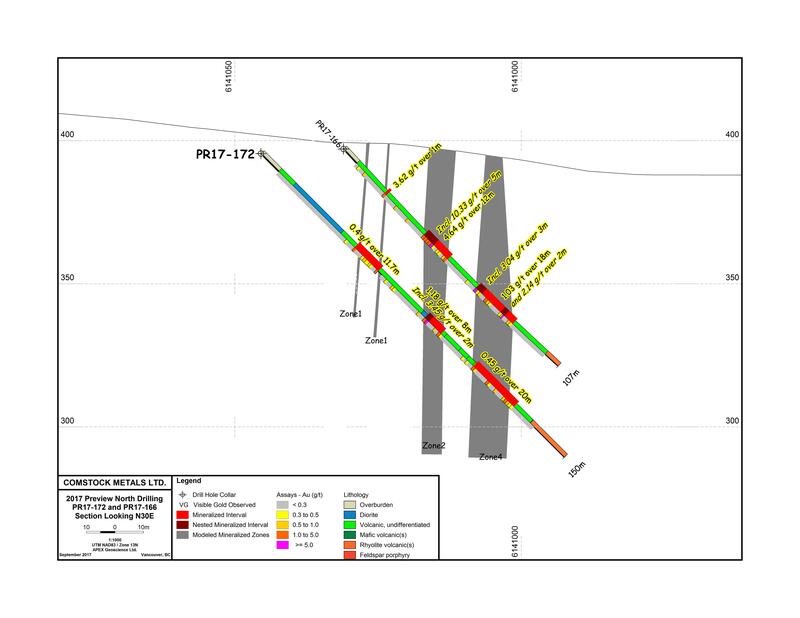 North Zone drill hole PR17-177 (-46.6o/122 azimuth) was drilled 30 m northeast from PR17-175, -176 and below the northern portion of the 50 m trench and 30 m southwest of the exploration adit and hole PR13-161. The hole passed through hanging wall diorite into sheared meta-volcanic rocks at 17.6 m downhole, and into granitic intrusive rocks at 39.1 m (see Section 5). At a depth of 42.5 m downhole, variably sheared, locally folded and chlorite altered granitic intrusive rocks host quartz-carbonate veining associated with arsenopyrite-pyrite mineralization over an interval of 18.5 m core width. Visible gold was observed at 56.6 m. Meta-volcanic rocks were intersected again at 60.1 m and felsic meta-volcanic rocks were intersected at 96.0 m downhole. North Zone drill hole PR17-178 (-53.1o/122 azimuth) was collared at the same location as PR17-167 and on the same section as PR13-163 and PR17-165. The hole collared into meta-volcanic rocks and passed through hanging wall diorite between 83.8 m and 112.4 m downhole (see Section 6). At a depth of 184.0 m downhole, highly strained, chlorite altered meta-volcanic rocks host quartz-carbonate veining associated with arsenopyrite-pyrrhotite-pyrite mineralization over 5.0 m core width. Visible gold was observed at 188.5 m. Footwall felsic meta-volcanic rocks were intersected at 214.7 m downhole. Kristopher Raffle P.Geo., Principal, and Christopher Livingstone, P.Geo., Project Geologist of APEX Geoscience Ltd., Qualified Persons as defined by National Instrument 43-101, supervised the exploration work and diamond drilling program at the Preview SW project and reviewed, verified (including sampling, analytical and test data) and compiled the data reported herein. David A. Terry, Ph.D., P.Geo., a Qualified Person as defined by National Instrument 43-101, and an Officer and Director of Comstock, has reviewed and approved the scientific and technical disclosure in this news release.